ZeRo5Is there any way to make the game refresh the main menu without quitting and restarting the game? It's really frustrating to have to keep rebooting the game just to move one element to the position you want it in. Help appreciated. Krayt ZeRo5Is there any way to make the game refresh the main menu without quitting and restarting the game? It's really frustrating to have to keep rebooting the game just to move one element to the position you want it in. Help appreciated. Try "toggle mat_antialias", I think that's the one you are looking for. You might have to go in the inventory and out sometimes to reload stuff. How do I add a button to my main menu to bring up the console? change any of the preexisting buttons' "Command" line (ReportBugButton for example) to "engine con_enable 1;toggleconsole" and that button will open the console. I have a problem with yayahud where target names appear misaligned with the boxes whenever I put my crosshair on a player but seem aligned when spectating a player. Changing the x pos for "targetnamelabeldebug" in targetid.res fixes it for the names that appear when you put your crosshair on a friendly player but breaks the one that appears when spectating a player. Is there any way to make the two independent from each other? Is it possible to disable the "new item" screen when you get a random item drop? How do i line up ammo and health . Im trying to have Ammo and health like in eve hud . Im using morehud black . I want to make it same position but in other hud. https://imgur.com/a/ABJrC This is how it look in eve hud. And this is how my more hud looks right now https://imgur.com/a/vuOR1. breathHow do i line up ammo and health . Im trying to have Ammo and health like in eve hud . Im using morehud black . I want to make it same position but in other hud. [quote=breath]How do i line up ammo and health . Im trying to have Ammo and health like in eve hud . Im using morehud black . I want to make it same position but in other hud. How can I change the color of the white box where the target's username appears? Any idea on how to get rid of that image behind the store? How do I remove the floating damage text (next to the crosshair) but keep the dmg text above my ammo? "fgcolor" "255 200 50 255"
I figured it out. I just had to change this value to gibberish. Howdy, I'm trying to move the stickybomb counter up, I forget how. FalkinghammerHowdy, I'm trying to move the stickybomb counter up, I forget how. [quote=Falkinghammer]Howdy, I'm trying to move the stickybomb counter up, I forget how. I know c is supposed to mean center of the screen; what do all these other letters mean? In the main menu, how do I edit the "Find a game" button and the "Queued for casual" panel? The text that displays your heal target's health being black on black is pretty tough to read, is there any way I can change the text to white? burkoThe text that displays your heal target's health being black on black is pretty tough to read, is there any way I can change the text to white? If it's for overheal numbers, then it's something like "PlayerStatusHealthValueTarget" in scripts/hudanimations.tf. [quote=burko]The text that displays your heal target's health being black on black is pretty tough to read, is there any way I can change the text to white? bLaIn the main menu, how do I edit the "Find a game" button and the "Queued for casual" panel? Additionally, what elements control the dialogues that pop up when you click the "disconnect/quit" button, as well as the XP bar at the end of a casual game? [quote=bLa]In the main menu, how do I edit the "Find a game" button and the "Queued for casual" panel? bLa Additionally, what elements control the dialogues that pop up when you click the "disconnect/quit" button, as well as the XP bar at the end of a casual game? omniYou need to put these 2 files into resource/ui/econ. They're not in the standard tf folders, they're actually in the hl2 folders. Hypnotize bLaIn the main menu, how do I edit the "Find a game" button and the "Queued for casual" panel? 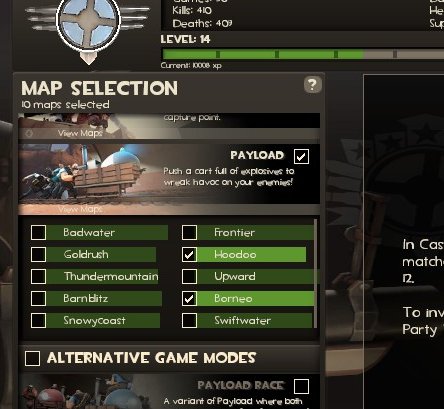 Edit: it's matchmakingcategorymappanel.res in resource/ui. [quote=Hypnotize][quote=bLa]In the main menu, how do I edit the "Find a game" button and the "Queued for casual" panel? 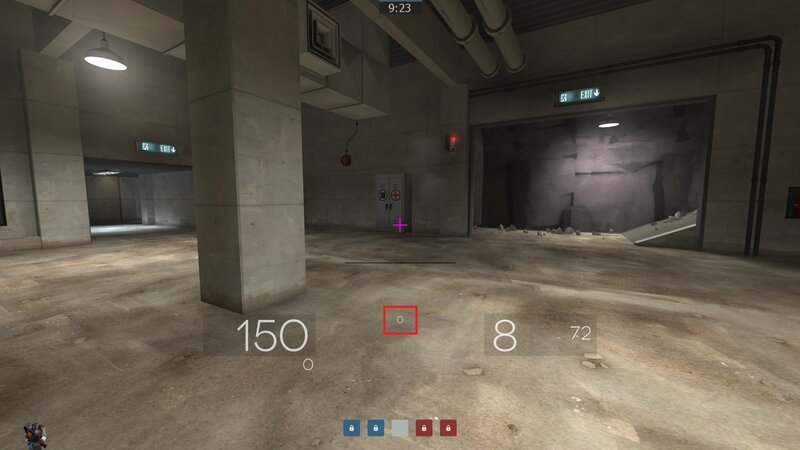 I was messing around in my HUD settings to try and move the health/ammo and other info such as dmg numbers and health regen closer to the crosshair. While messing with it, the health regen seems to be cut off. I've tried messing with CHealthAccountPanel's wide and tall vars both in hudlayout.res and in hudhealthaccount.res to no avail. ZhdukenI was messing around in my HUD settings to try and move the health/ammo and other info such as dmg numbers and health regen closer to the crosshair. While messing with it, the health regen seems to be cut off. I've tried messing with CHealthAccountPanel's wide and tall vars both in hudlayout.res and in hudhealthaccount.res to no avail. Go to HUDHealthAccount.res and decrease the values of "delta_item_start_y" and "delta_item_end_y", then increase the y-pos of CHealthAccountPanel in hudlayout.res by the same amount as the value by which you decreased the delta values. [quote=Zhduken]I was messing around in my HUD settings to try and move the health/ammo and other info such as dmg numbers and health regen closer to the crosshair. While messing with it, the health regen seems to be cut off. I've tried messing with CHealthAccountPanel's wide and tall vars both in hudlayout.res and in hudhealthaccount.res to no avail. Presumably in hudanimations you have HudHealthBonusPulse either commented out or simply not present. 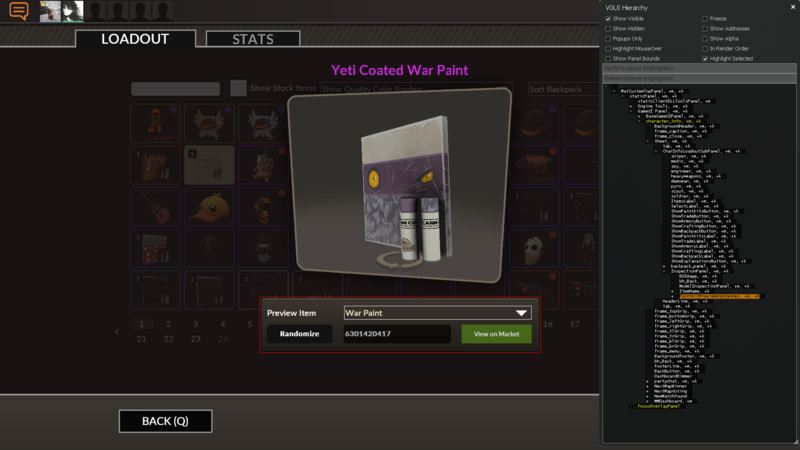 What file handles the war paint preview window. When "inspecting in-game" from the market it opens up a panel, but it's bugged in my HUD. The top image is the stock HUD. Bottom is mine. You can see the preview panel is tiny and stuck in a corner. Something in econ maybe? Thanks! The tree pointed me towards charinfoloadoutsubpanel.res. There were a few files I never got around to updating in Jungle Inferno because I was overwhelmed with the changes, and that was one of them. They added some paint stuff to that file that slipped under my radar. Also just spotted the InspectionPanel way at the bottom. 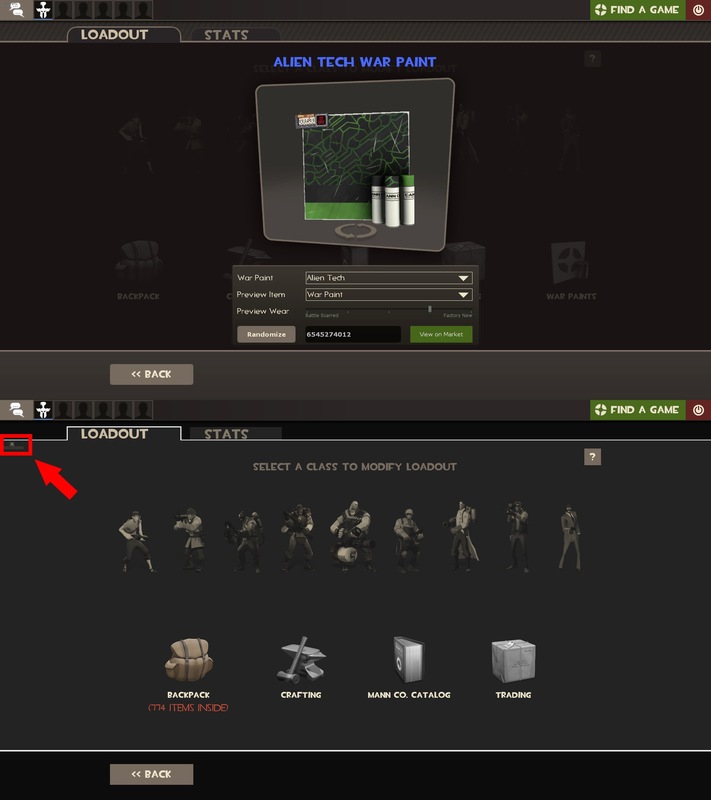 I never even knew the Item page had a WarPaint button until just now!